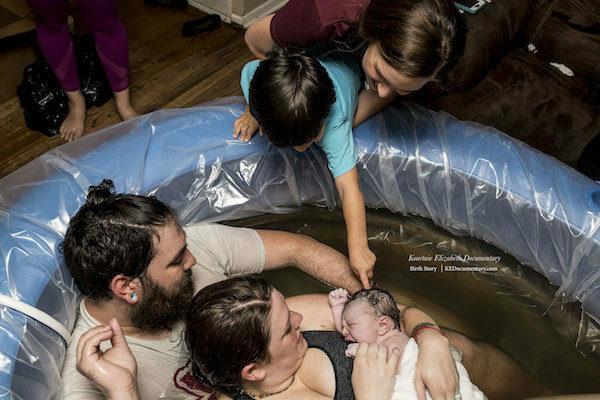 Texan mum-of-four Jynessa Weed and her birth photographer Kourtnie Elizabeth generously shared this beautiful home water birth story with Babyology readers. 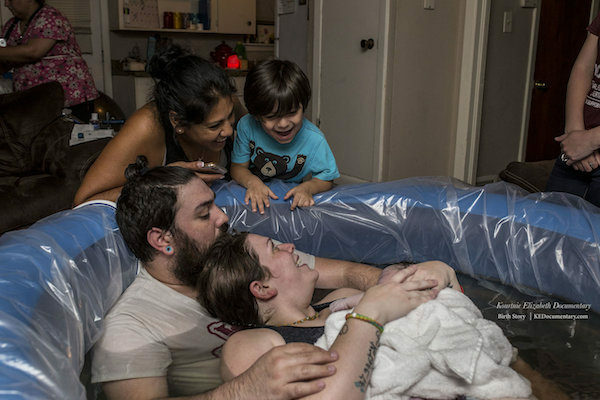 Jynessa was just over the full-term mark with baby number four, when her contractions started, slowly and steadily. 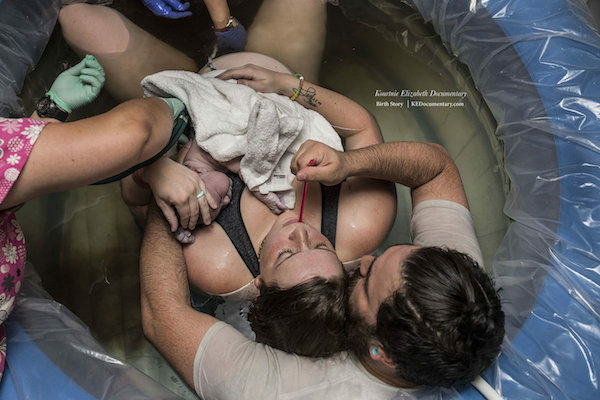 Amazingly, Jynessa was still working at 40 weeks, so she determined to soldier on, regardless. “I started noticing this annoying pinching feeling in my cervix; I was at work just trying to ignore it,” Jynessa said. 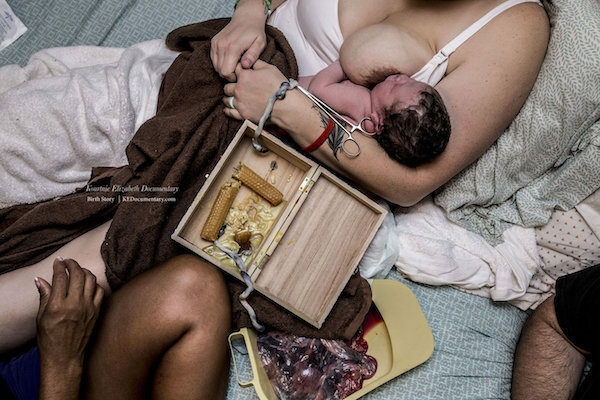 An hour later, she did a bit of a rethink, calling her midwife, Mercy, and arranging to meet her at home to find out what the pinching was all about. Mercy soon discovered the mum-to-be was already 3cm dilated, but Jynessa was in two minds (but hopeful!) 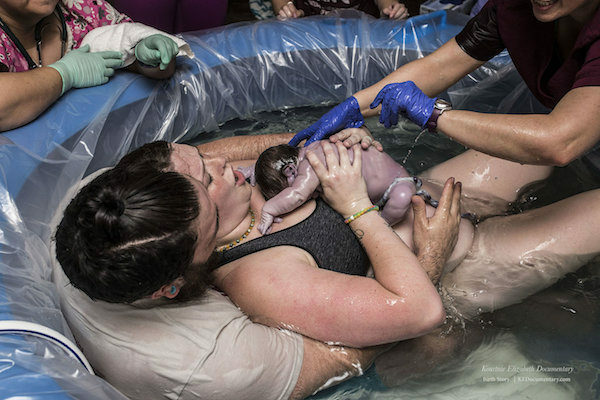 about whether this baby was really on the way. Adopting the wait-and-see approach, Jynessa headed out for a manicure with her mum-in-law. She quickly realised, on arrival at the nail salon, that this actually really WAS IT! 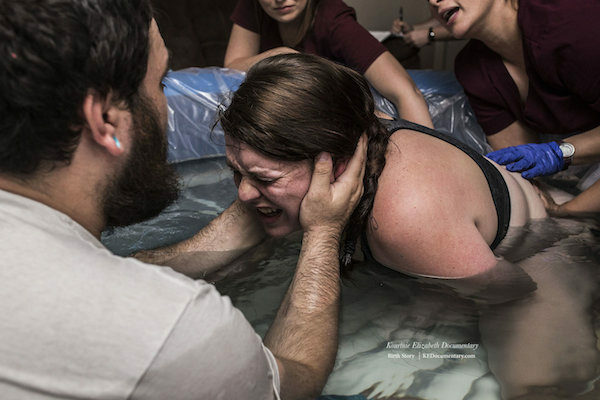 Contractions became more intense and more regular and Jynessa’s father-in-law ended up driving her home… to have her baby! 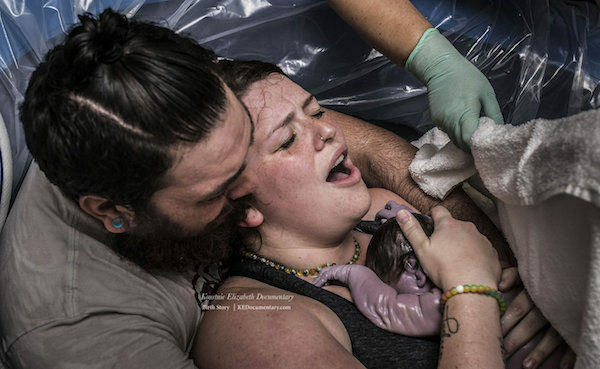 Photographer Kourtnie Elizabeth – of KE Documentary – was there to beautifully capture the birth. 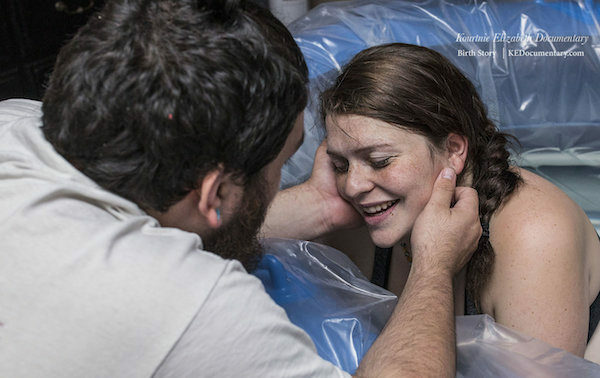 “I love being a part of an amazing team, of being trusted with such a life changing moment in a family’s life,” Kourtnie Elizabeth said. “I changed out of my clothes and into comfy shorts and a sports bra. 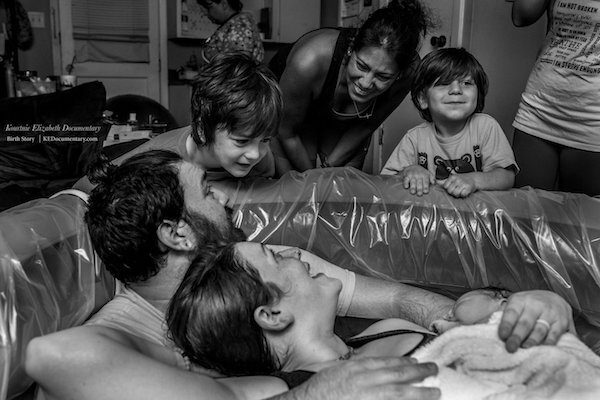 Can I even begin to tell you how awesome it was to labor in my own home? Walking around and listening to my own music. I face-timed my dad as we were getting the pool set up,” Jynessa recalls. 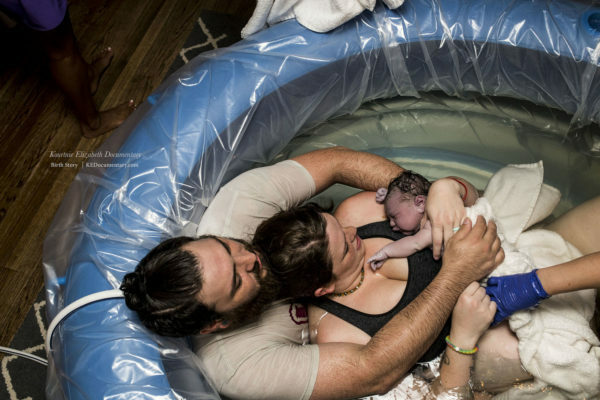 Jynessa was experiencing “back labour” and, in pain and understandably a bit frightened, was unsure if she could really manage this birth. 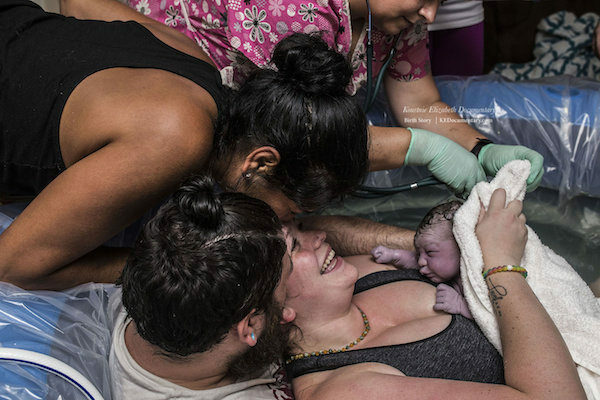 “If you have ever had the pleasure of experiencing back labor it’s pretty much hell on earth. 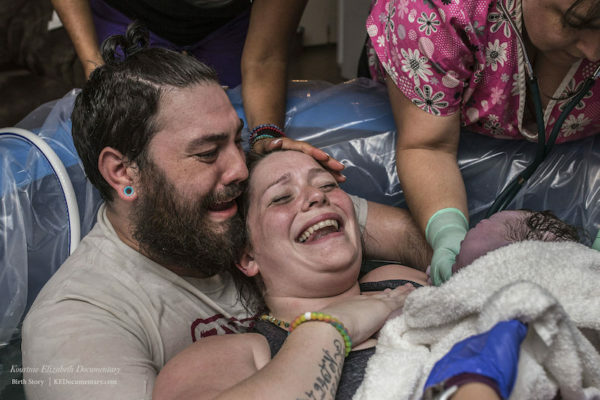 Liz [Jynessa’s doula] got out her tens unit which was ahhhmazing, still painful but manageable at that point,” Jynessa explained. 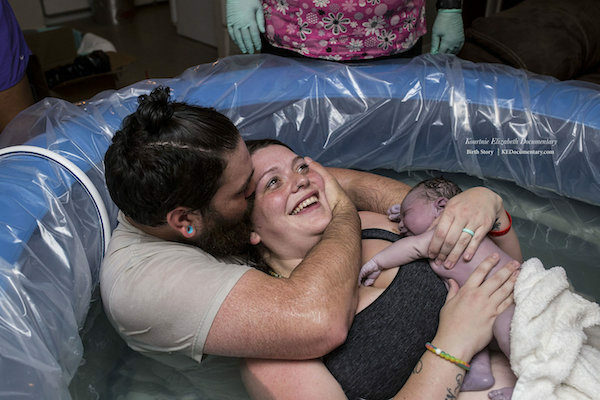 Needless to say, her misgivings were unfounded and she handled her labour beautifully – with the help of partner Anthony and an outstanding birth team. Baby Scout Madelynn Dawn Weed was born later that evening and could not have been more beautifully welcomed or loved by her family. 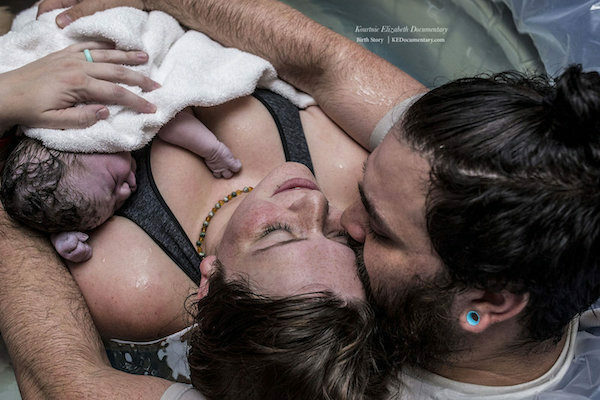 You can read Jynessa’s full birth story – in her own words – over at KE Documentary– photographer Kourtnie Elizabeth’s website. Thanks so much to Jynessa and Kourtnie for sharing this story with us.